CAC returning volunteer Frederick Schwarzmaier talks about year 3 of our partnership with Delta Cultura in Cape Verde. October 21st 2015. Imagine yourself after a day of work floating on the pleasantly tempered sea. Above you, the sun is setting in a picture-perfect orange sky and from the corner of your eye you see green rolling hills and a quiet beach with several palm trees. It’s a privilege reserved for very few people. However, in Tarrafal, Markus and I were fortunate enough to call it an ordinary day. 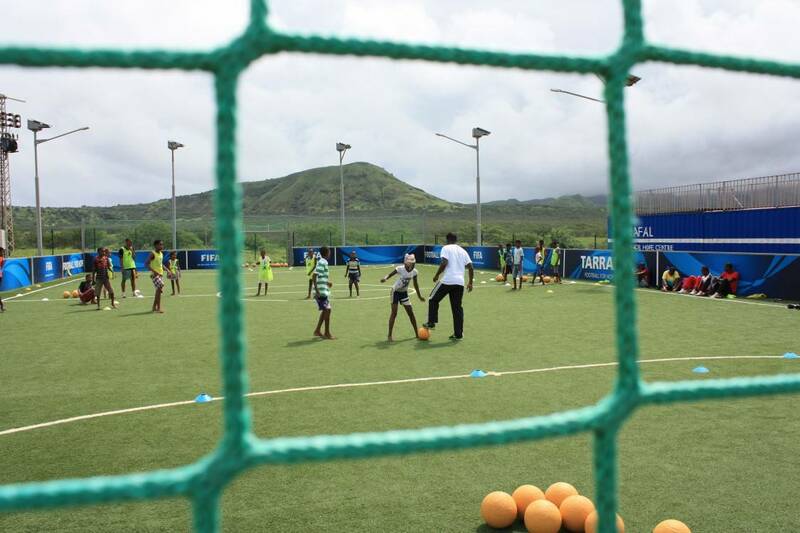 Unlike other programs, in Tarrafal we found an artificial turf with floodlights on top of a hill surrounded by mountains and the sea. This is one of 20 artificial pitches built across Africa by the FIFA Football for Hope Initiative associated with the 2010 World Cup in South Africa. In this case Delta Cultura was the beneficiary. Delta Cultura, our local partner which we visited for the third time in our Hat-Trick initiative, is a local organization which runs an education center for primary and secondary school pupils in Tarrafal. Its founder, Florian, and one of its tutors, Gilson, helped us around the clock to quickly immerse ourselves into the new surroundings. With the many pupils at the site, we had enough participants to conduct any game. Great signs that promised a successful two weeks with the local coaches. But would the local coaches follow through on this promise? In our first session in the classroom we chatted about the participants` diverse achievements over the past year and the program’s outlook. It was great to hear that participants implemented certain games from last year in their communities or schools. Some participants even invented new games for International Women’s Day and Children’s Day. Beyond that, one participating teacher had organized a one-week activity at his football school where he addressed school drop-out and teenage pregnancy through Football for Social Impact. These stories were like music to our ears and strongly motivated us to practice on-field with the coaches. As with many of our programs, the issue of tardiness would accompany us during the week. Apart from the tardiness issue, we had found a perfect setting for the program. Nonetheless, the area that needed improving the most was having purposeful and efficient discussions. This became apparent during a game of “95% Football” – a game that combines elements of tag with those of football. It was just after I passed the goal line seemingly scoring when the other team started protesting – “A second ball was in play.” A tight group of ranting and flailing players from both teams had formed, The participants embarked on wild discussions without any valuable outcome. We stepped in to provide structure within the discussion. In order to find a solution, the teams decided to designate a captain who would try to find a solution together. A word and a blow – GOAL! The members of the team that had now conceded the goal were noticeably unhappy with the result, again loudly arguing and flailing. Reminding them that we had agreed that only the captains have the final call the turmoil quickly settled. Once more, they nominated a (new) captain to discuss the case with the opposing captain in order to agree on a solution in their favor. Despite the change, the captain of the team I was in must have had some good points because even the newly nominated captain consented – GOAL! Finally, everyone acknowledged the decision and we continued to play with the next dispute just around the corner. Eventually the participants had found a way to solve their problem peacefully. Next week we will increasingly focus on game development with the coaches. With a little bit of guidance, we are confident that many new and fun games will be created. 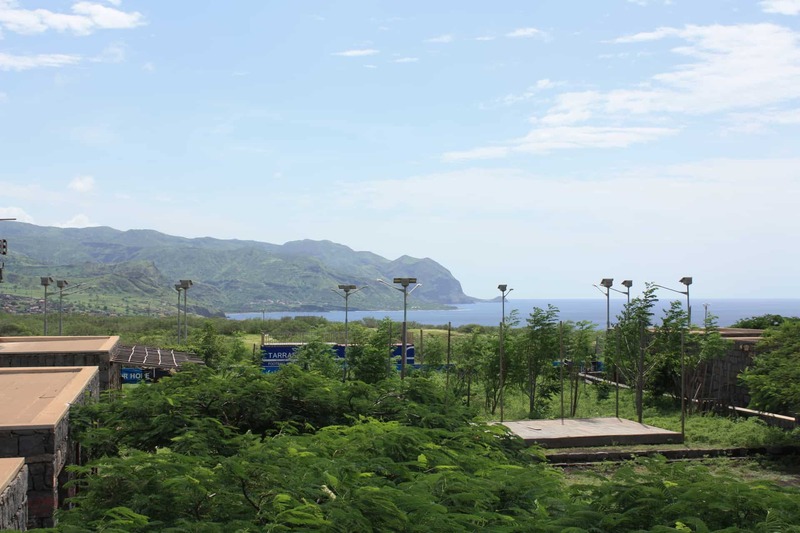 For now, all signs point to a successful second week here in Tarrafal.